You are cordially invited to join us on December 1st at midnight EST to debut the December Paper Trails Kit. Believe me it is full of absolute GORGEOUSNESS!!!! Each of the Design Team Members will have a DEBUT project to share with you using the kit and a little birdie told me that there will be RAK's too! Then you will want to race to the Paper Trails store to purchase the December Kit because they will be gone quick as a wink. Karen truly outdid herself this time!!! 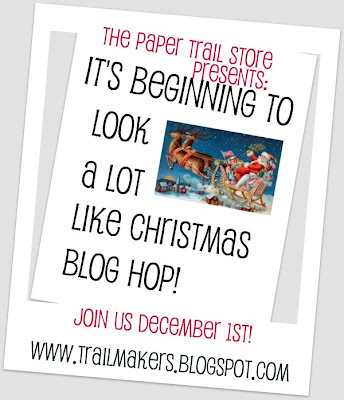 The blog hop will last until December 4th at 11pm EST and then RAK's will be pulled on December 5th and announced!!! Are you ready to get your hop on?